We had some friends over on the weekend, and I thought it would be nice to eat outside. 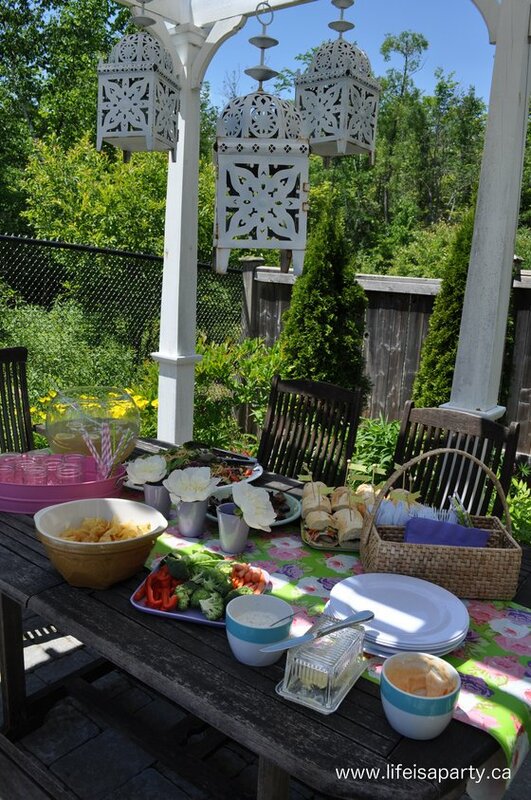 This was our first outdoor meal of the year with company, so my week (and my sweet husbands) included gardening, grass cutting, mulching, and generally finishing up some of those spring jobs that never seemed to have been finished. While I was working away in the garden, I was thinking about the table too…like you do. I wanted to use some floral, but in a fun way with some fresh colours, but I also wanted to use what I had. Here’s what I came up with. The whole look was inspired by the wrapping paper I found at Michaels, and used as a table runner. I loved the bright lime green, along with the pink and purple. These are all colours I’ve used before, so everything else I already had and it was just a matter of pulling it all together. This little wicker caddy works great for a casual party, and lets everyone just help themselves. And you know how I love paper straws. Pretty mason jars make great glasses, and they’re not at all fragile, which is great for outside. 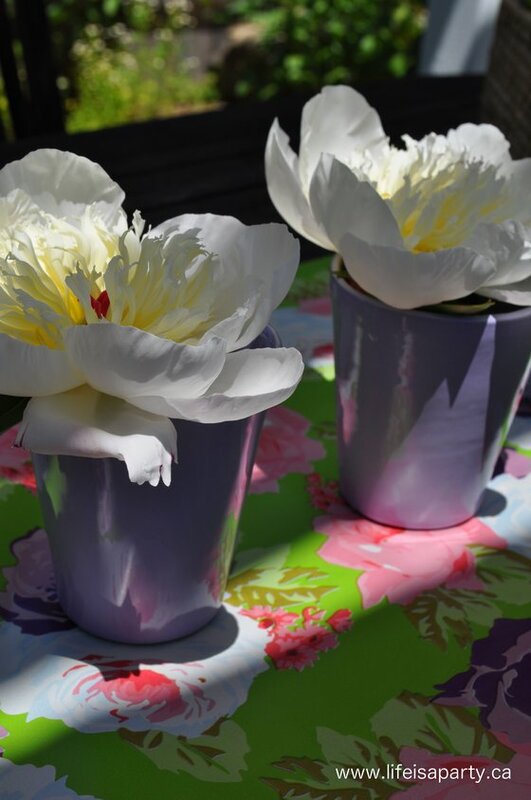 I used pretty white peonies from my garden for a simple centre piece, three down the middle of the table. For lunch we had the amazing Vietnamese Baguettes that I shared yesterday, love the pretty skewers in them with a washi tape flag too. 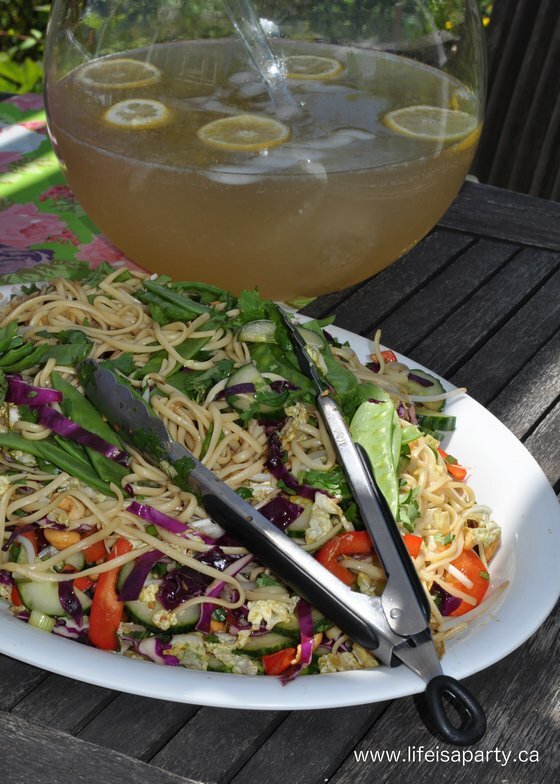 And the perfect accompaniment was the Pioneer Woman’s Asian Noodle Salad. I tried it for the first time and it was really, really good. It does make a HUGE amount. I cut down the linguine to half a package, the cabbages to 1/4 head each, and only used one pepper and one cucumber. I added snow peas and about 2-3 tbsp. of honey to the dressing for my version. This is a great one to feed a crowd and the leftovers were yummy too. We had a lovely relaxed time outside, and then came back in the house for dessert. I made this pavlova, with summer berries and whipped cream. 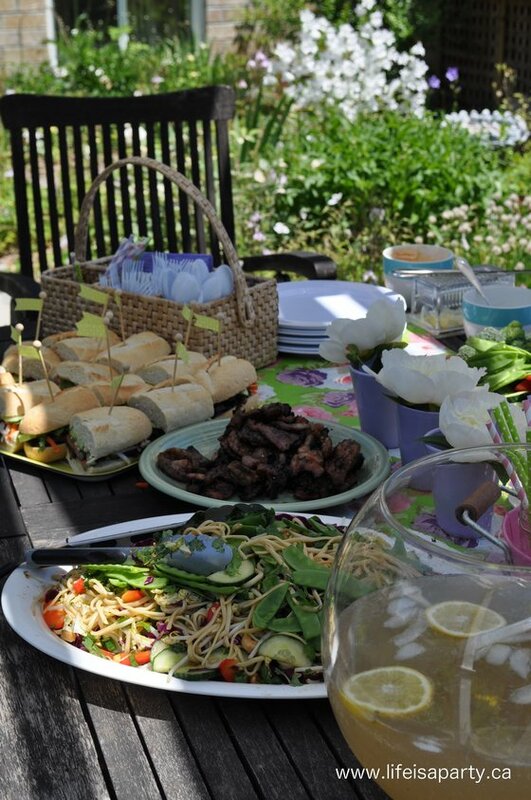 On a warm summer day with wonderful food, and dear friends to share it with, life really is a party! This post is linked up at Between Naps on the Porch. What a beautiful setting for a festive dinner with friends! 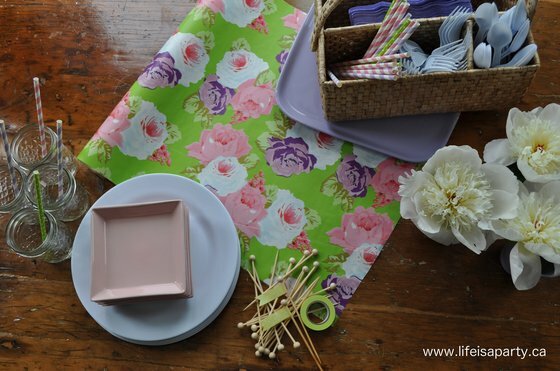 Great idea to use that pretty wrapping paper as a runner, and you carried out the color scheme perfectly! It all looks so pretty and so tasty! Great photography! Soooo pretty!! 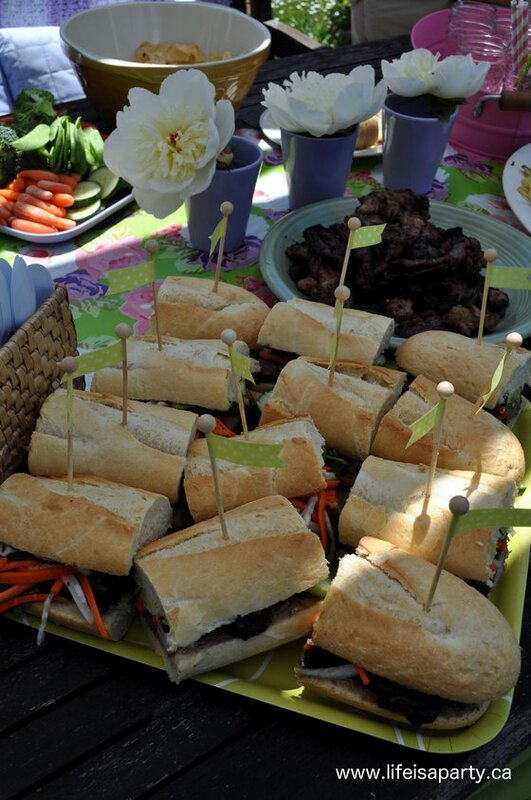 now I am hungry looking at those gorgeous sandwiches. 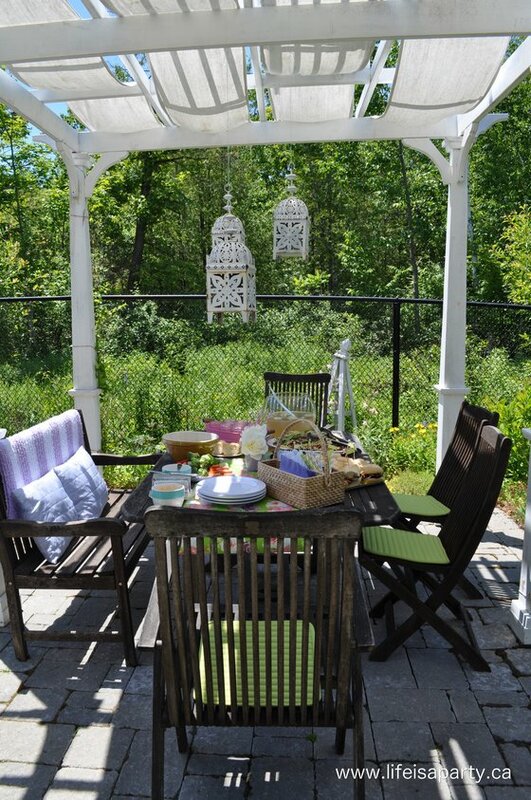 and the lanterns hanging down is a wonderful touch…WHat a great spot you set up! 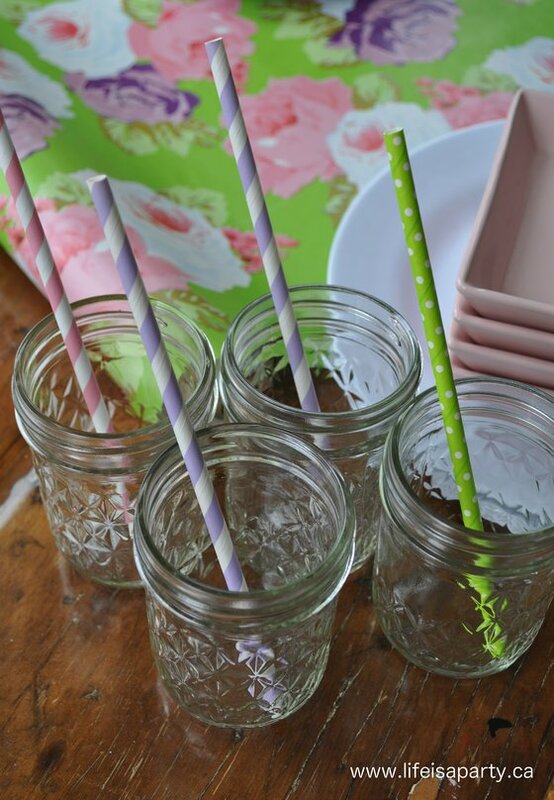 The paper straws are absolutely fabulous! Clever idea about the runner, too. Love the lanterns and peonies will always make me smile. Very nice setting!! Hi, Dannyelle! 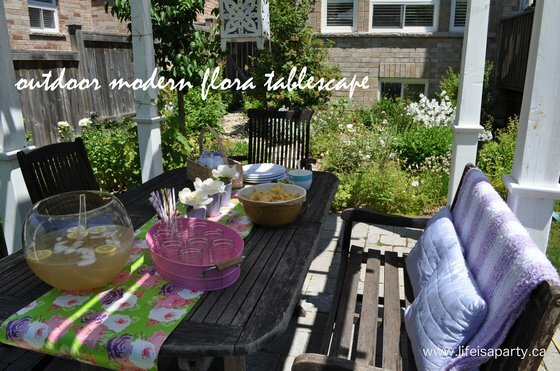 I think this is my first visit to your blog via Susan’s Tablescape Thursday. I’m so glad to see your post today because I just love casual outdoor settings that have true flair! This is wonderful! I love the lanterns suspended above the table! Your feast looks fantastic!!! You must really enjoy cooking! And you displayed the food in such an inviting way, too! LOVE the skewers in the baguette sandwiches! This is a beautiful picnic! I hope you and your husband are able to recover soon from all the outdoor work! Look at it this way…a good deal of it is done now, so you can have a bit more outdoor fun! Enjoy your weekend!!! Beautiful…that wrapping paper is a great idea, and love the way you used it as the inspiration for your colors. Love those wonderful lanterns! Wow! what a pretty setting!! 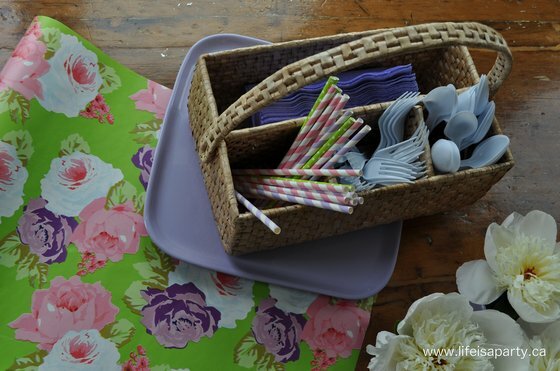 I love the floral paper, the patterned straws, and the little washi tape flags in your sandwiches!! Beautiful table!! Very nice, looks like a lovely place to enjoy a great meal.